An au-pair in your home is one of the most affordable forms of child care available. When you choose an au-pair, you give your family a flexible and dependable form of live-in child care at a reasonable cost. Au-pairs provide your children with personal care in the familiar environment of your home. Your au-pair will arrange her weekly working hours to fit your own schedule. In addition to caring for your children, an au-pair can also assist you with household responsibilities, such as preparing your children's meals and helping them to keep their rooms neat, as well as driving them to and from school, appointments, and activities. 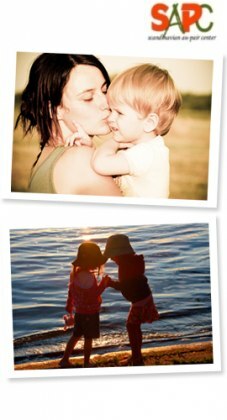 Through our personalized matching process we will professionally match your family with an au-pair. We evaluate your child care needs, lifestyle, and personality when selecting the best au-pair for your family. With our unique one-to-one matching process, you can be assured you have the exclusive choice of an au-pair. You will not be competing with other families for your desired candidate. Each au-pair candidate is personally interviewed and screened before being considered. Au-pair candidates must provide personal references, child related references, a criminal background check, a current driving licence (if required), and verification of education. Part of the interview process is conducted in English to ensure English language skills. All references are verified. We select only those candidates in whom we have complete confidence. What is expected of an au-pair? Cultural interaction. The au-pair should be willing to share with the host family, especially the children, what life is like in his/her country. Even teaching the children a bit of the language is encouraged. Children typically respond well to this type of interaction, and it helps them to understand how the world is different in different places. Up to 35 hours per week of child care (45 hours in the US). This is expected to fit the host family's working schedule. There is a requirement for a full two days off during the week. (Generally the au-pair will take this time off during the weekend.) Child care is defined by the parents and may include diaper changing, bathing, dressing, and transportation to and from school, feeding, playing, and general interaction. Light housework. This means that the au-pair keeps his/her personal space neat and tidy, does his/her own laundry, shares the duty of laundry with the host family (as reasonable), and shares with the host family the job of keeping the area used by the children neat and tidy. What is NOT expected of an au-pair? More than 35 hours per week of child care (45 hours in the US). Heavy housework. The au-pair is not a maid! - Abuse alcoholic beverages. Technically, no partying. - Abuse the children physically, emotionally, or verbally. - Abuse the property of the host family in any way. - Break any laws governing the host family's country of residence. - Be solely responsible for the children for more than 24 hours on a regular basis. +46 42 20 44 02 if you have a question that is not answered here. We have three children. Do we pay extra? No. What you pay us and the au-pair is not related to the number of children you have. How long will it be before our au-pair arrives? The time it takes to find an au-pair varies, depending on the specific needs of your family and the availability of an au-pair with corresponding qualifications. If you require an au-pair immediately, contact our office at +46 42 20 44 02 and we will do our best to accommodate your family! Will our au-pair be able to care for an infant? Is there an additional fee? Yes, your au-pair will be able to care for your infant child. Your family will be matched with an au-pair who has prior infant care experience. There is no additional fee for caring for infants. I am a single parent. Will I be able to have an au-pair? Absolutely! It might take a little longer to find the right au-pair for your family, but many single-parent homes have enjoyed the benefits of having an au-pair. What happens if it just doesn't work out? It's a good idea to let some time pass before assuming there are irreconcilable differences, perhaps a month. The au-pair may need a little time to settle in and the host family may need a little time to get accustomed to the new family member. Mismatches are a rare occurrence. If difficulties continue, we will rematch you with a different au-pair as soon as possible. We have young boys. Is it possible for us to host a male au-pair? Yes. The majority of au-pair candidates are female, but there are also many qualified male au-pairs available. - The family has to pay half the flight ticket cost for the au-pair. - If the family decides to pay for a return ticket it's possible to split the amount in 52 weekly payments and pay the au-pair a small amount each week in addition to the weekly pay. - The family has to pay for a language course for the au-pair if that is a law in the family's country.